My options were to screen-scrape from the new w3c validator, find an alternative service (either web or something that could be included within Scrutiny) or to write my own. In the absence of a 'quick fix', I replaced the full website validation feature with a 'single page validation' (context menu item in SEO table). Feedback has been generally good, some users agreeing with my own feeling that because websites tend to be based on template(s), validating all pages isn't necessary. For this reason, it's unlikely that the new tool mentioned below will be part of Scrutiny, but I may include it in the dmg as a separate free app. I have now found an alternative, that works well and doesn't rely on a web service or need anything extra installed. 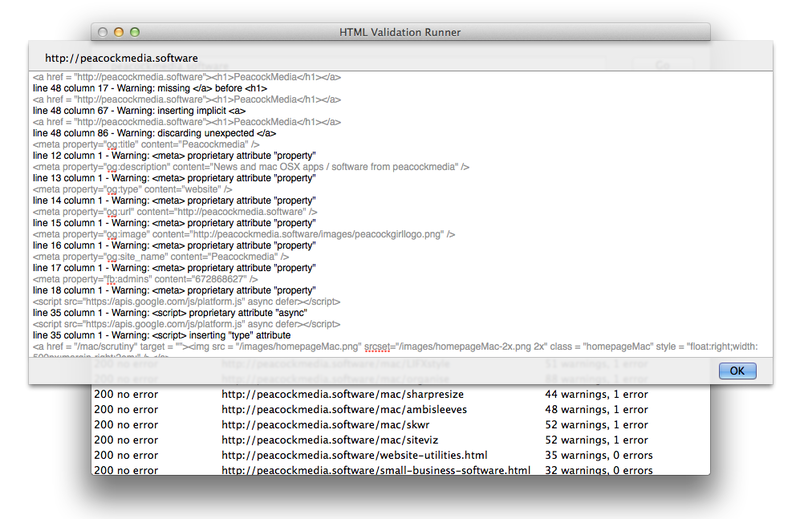 It does give slightly different results to the w3c validator, but I guess any two tools will give different results. My first prototype is now working, if you are interested in being able to scan your site, validating the html for all pages, and would like to give this tool a whirl, please just ask. All thoughts and comments are very welcome, email me or use the comments. 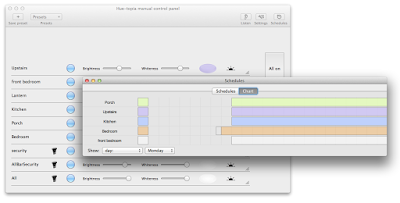 Hue-topia gives you a number of ways to schedule your lamps; groups, presets, dawn/dusk, and with a number of schedules set up, it may be difficult to see what's going on. The chart shows you any day or a week (bearing in mind that schedules can be set to happen on particular days). It will be ready for beta testing soon. If you're interested in running it, please let me know. 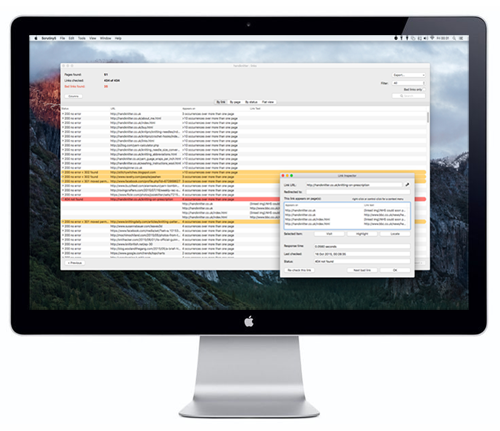 LIFXstyle gives you some very powerful tools for scheduling your lamps. Schedule individual lamps, groups to switch on, off or change colour. Set up presets and trigger those on schedule. With a number of schedules set up (possibly overlapping) it's difficult to see exactly what's going to happen. Or if a lamp doesn't behave as expected, the reason may not be obvious. Viewing your schedules as a gantt chart should help. View a day (24hrs) or a whole week. Click a block (either to the left or the right) to see the particular schedule which is responsible at that point. This chart is now in alpha testing. If you'd like a copy for beta testing ahead of the main release, please get in touch. NB: Scrutiny v6 is currently in beta. Don't let this put you off - If you buy Scrutiny 5 now, Scrutiny v6 will be a free upgrade. A new feature in the v6 beta of Scrutiny (from v6.0.2) is the ability to trace all the redirects of the http request / response. If a url is redirected, it is usually redirected once but it can be two or more times. 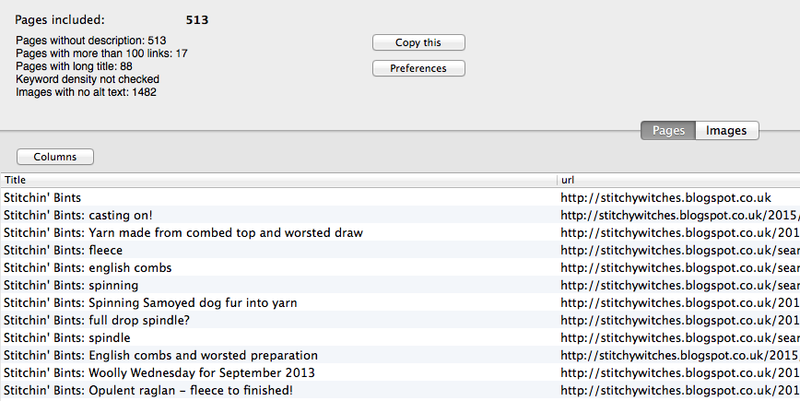 In these cases, a button will be available beside the 'redirect url' field of the link inspector. The button will display the number of redirects. Pressing the button triggers a new request to be sent and a trace will be shown showing all of the redirects as they happen and the status codes. Which web pages does Scrutiny include in its SEO table and Sitemap table? When asked that question recently I had to look through code to find definitive answers (not ideal!) and realised that the manual should contain that information. As always, I'm always very happy to look into any particular example that you can't make sense of. * this doesn't mean a .html file extension, but the mime type of the page as it is served up. Most web pages will be html. Images are shown in the SEO results but in a separate table which shows the url, page it appears on, and the alt text. ** Although Integrity Plus doesn't display SEO results (at present) it does display the same sitemap table as Scrutiny and all of the rules above apply. The most major change isn't a visible one. Scrutiny 6 is fitted with the 'v6 engine' which is faster and more efficient than before. 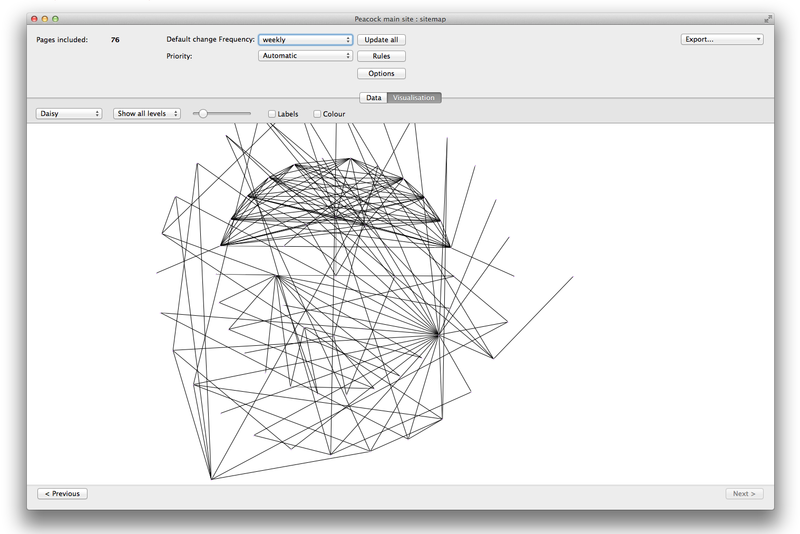 Robotize has been an experimental app which allows you to see your web pages as a robot does (including search engine bots such as Googlebot). 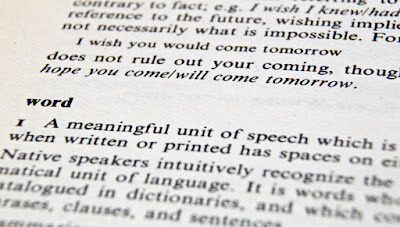 Text-only, linearised, headings as an outline, image alt text etc. 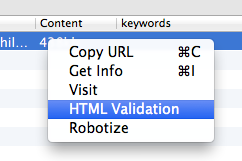 There's a context menu item for robotize within the SEO results table. 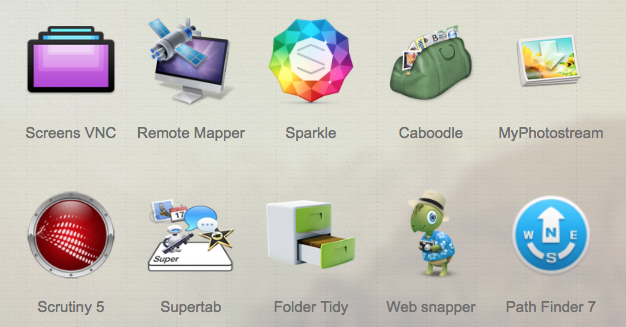 Or you can open a robotize window any time from the Tools > Robotize (cmd-3) or from the Tasks screen. Once open, a robotize window (you can open multiple) functions as a browser, with address bar, forward / back and refresh buttons. The last main addition is Siteviz. 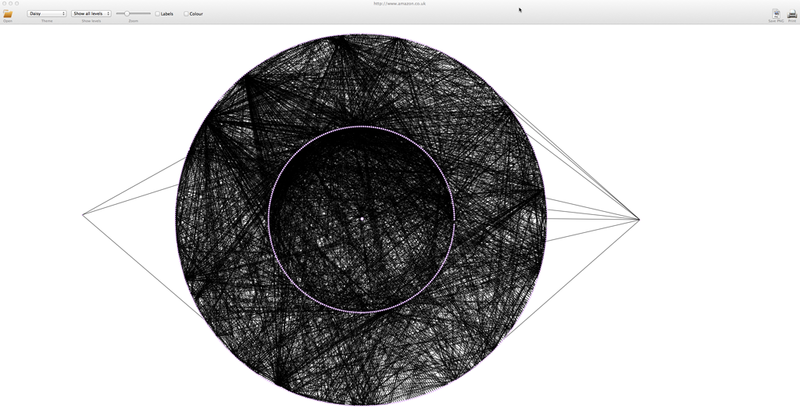 Another previously-experimental app, now more mature and built into Scrutiny. Integrity and Scrutiny have long exported a .dot (visualisation) file which can be opened using a graphing app. SiteViz is a free (still beta) app which opens such files. Only missing from Scrutiny is SiteViz's 3D theme. (This relies on technology which is 10.7+ and Scrutiny is still supported on 10.6 (Snow Leopard).) For the 3D theme you can still export the site as .dot and open using the free SiteViz. 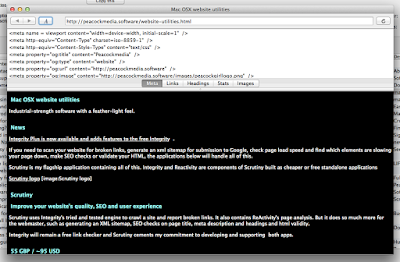 Both the current stable version and the new beta are available at Scrutiny's home page. The beta is currently free. When the licensing is implemented, v6 will be a free upgrade for existing licence holders. 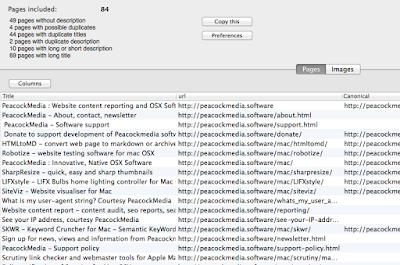 Website scrutinizer Scrutiny is currently on offer over at Macupdate - 60% discount until 28 Oct. Scrutiny offers the link-checking functionality of Integrity and Integrity Plus, XML sitemap generation, spelling and grammar checking, website search and much more. Today a scan of 3 million links finished. That in itself isn't a breakthrough because I've previously made such a scan, but this time thanks to a very small change at the very heart of the new v6 crawling engine, at the end of this 3 million link scan, the app was still working within expected resources and both the app and the Mac were still responsive. So we're now 'game on' for a 5 million link crawl. The aim of the game is to find out whether the 'six degrees' theory is true (whether you can really reach any of the 5 million English language pages within six clicks). In this new video we take a look at how to use Scrutiny to make some important UX and SEO checks over your Everweb website. The checks themselves apply to any website, but EverWeb makes it easy to correct the issues, as we demonstrate here. 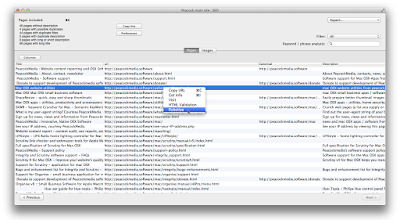 This tutorial uses Scrutiny for Mac and the EverWeb 'drag and drop' content management system. 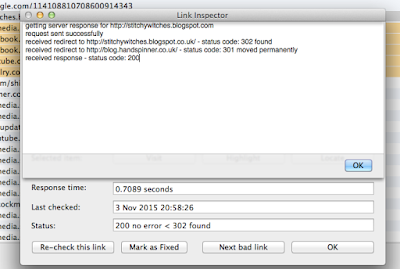 Links become broken over time (link rot) so a regular link check is important. 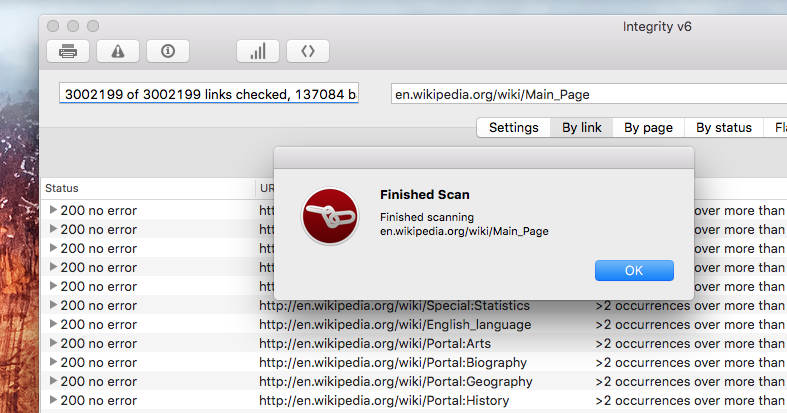 Everweb helps with this issue because it manages the links in your navigator, but links in your content are still vulnerable to your own or external pages naturally being moved, changed or deleted. Fortunately, finding them and fixing them is easy, as demonstrated. 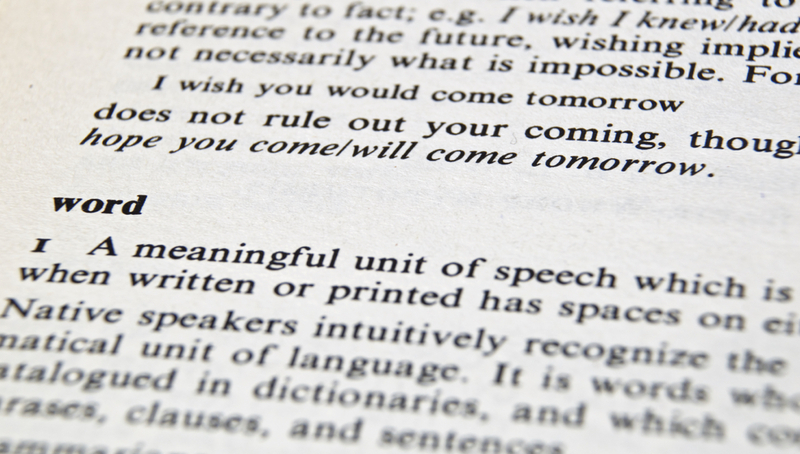 The title tag and meta description are very important (and a good opportunity) for SEO. Scrutiny will highlight any that are missing, too long or too short. EverWeb makes it a breeze to update these where necessary. Alt text for your images is also important (depending on the image). Once again, Scrutiny can highlight any potential issues / keyword opportunities and the video shows you how to update your site. The site contains links to "docs.google...." or "drive.google..."
The google links work in a browser without the browser crashing, even with cookies and js switched off (which is how Integrity and Scrutiny generally send their requests). I have two workarounds. 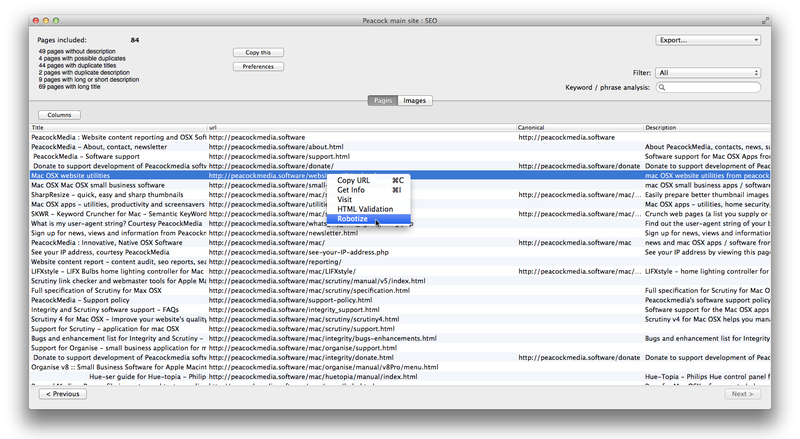 The first is easy - go to Preferences and switch the User Agent string to one of the browsers. I've just released new versions of Integrity and Integrity Plus (v5.4.2) and Scrutiny (v5.9.12) which contain a little hack meaning that you can continue using the default UA string for Integrity or Scrutiny and the scan will complete with these links being tested. Reading about artificial neural networks has been a life-changer. That led on to the unexpected topic of the genetic algorithm, which is very effective by itself (i.e. 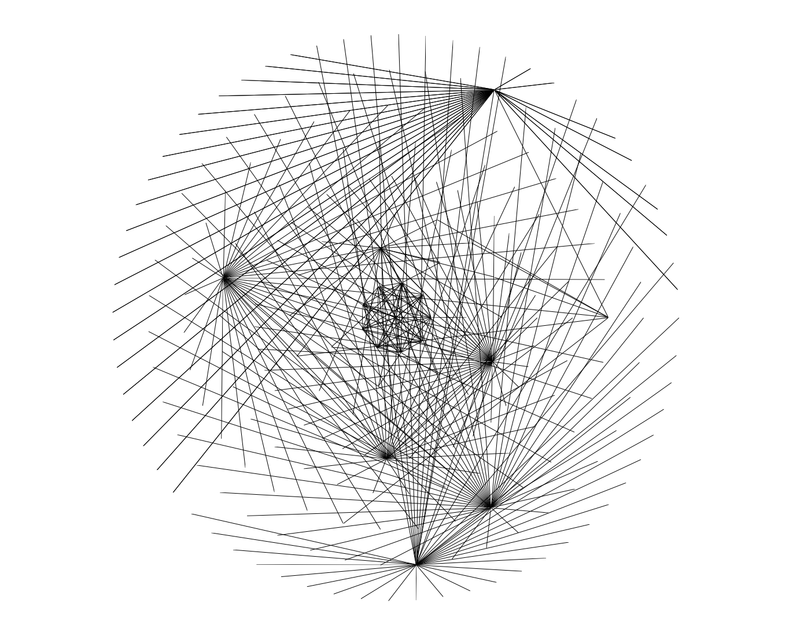 without using a neural network) at solving tricky problems. After working through my first example I was really astonished to find that applying rules like crossover and mutation (mimicking our own reproduction) in a population of initial random data, you arrive at a very fit population (i.e. gets you lots of good answers very close to the best answer) in remarkably few generations. This is really profound stuff and I'm more excited than I have been since I first came to conventional computing in the mid-80s. If you watch a trace of your data 'evolving', it's perfectly obvious why we reproduce sexually - anything which reproduces this way can become fit for a new environment or solve a problem in remarkably few generations. It's also clear that you can produce something very distinct (all depending on your test for fitness) from random data very quickly. Thus the intricate watch found on a beach (as long as it could be the product of rules such as genetic crossover and mutation and meets a need perfectly) isn't so remarkable. To demonstrate all this, and just a fun exercise in this stuff, is a face (a very special one) evolving from random noise. 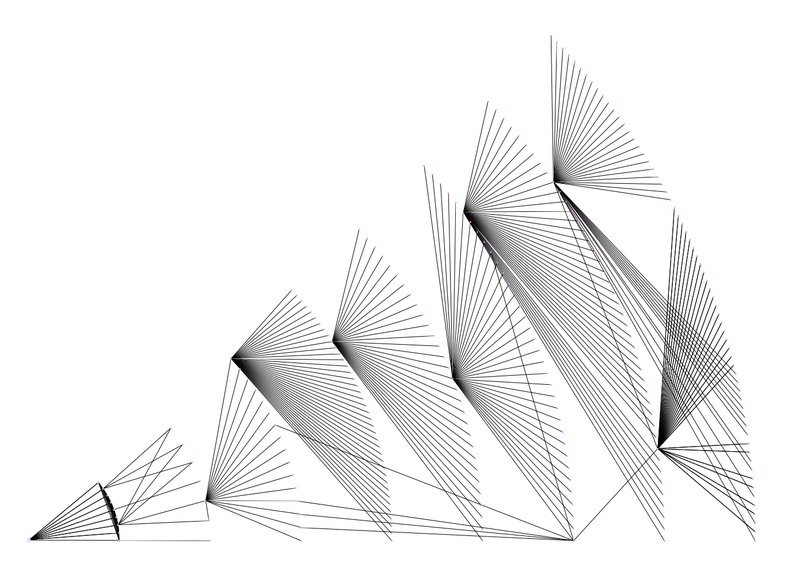 Without going into too much detail (that's all here) this exercise starts with a 'population' of chromosomes made of random numbers, which represent pixels in the images. For each new generation, the rules of crossover and mutation* and a test for fitness are applied. 'Survival of the fittest' isn't a good description of what really goes on in the natural world or in our algorithm here. Instead, individuals are randomly selected for reproduction with a bias towards the fittest. The infinite monkeys concept isn't helpful here either. Sometimes an answer to a solution can appear out of random data (the bigger the population, the more likely) but this isn't generating random data until the right answer is found, it's starting with random data and applying some rules to work towards and very quickly arrive at the right answer. For a smoother animation, the picture in this video isn't the best picture from each generation, but an average of all of them. It shows that a whole population becomes very fit in a short time, rather than just a few outstanding individuals getting very fit and then passing on their genes as the terms 'survival of the fittest' or 'natural selection' imply. * We tend to associate genetic mutation with disease, but it's an important part of this process. ** My title is a response to the 'cosmic watchmaker' argument. It's a terrible analogie for many reasons, not least of which is that a timepiece is obviously a manufactured tool (like a flint axe) and not a living, reproducing being. But I'm really not interested in the religious argument, only in the uses for these amazing, almost magical techniques. 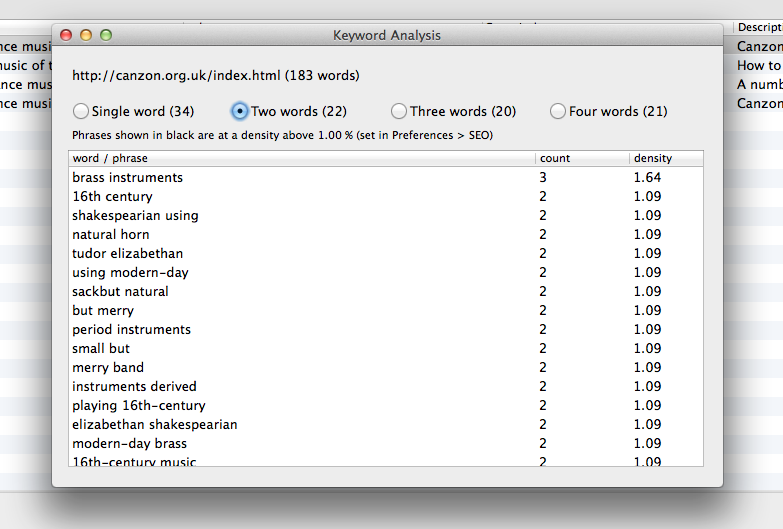 I've just seen this post by Sean at SEO Hacker about conducting a content audit. There's lots of useful advice - checking for keywords in page titles, length of meta description, length of page title, thin content, grammar check, broken links, avoiding keyword stuffing, images with no alt text. Sean's article expands on all of these things and is well worth a read. But he begins by making a spreadsheet listing all of your pages and copy-and-pasting each page title and other information manually. Here's the 'getting started' video once more, which focuses mainly on making a scan but does visit the SEO results from where you can use the filter button and keyword search box to perform the checks above. Or if you like you can export to CSV and open in a spreadsheet to do more of a visual check as Sean suggests, saving you the copying and pasting. Problem: Because of some changes with the w3c validator, Scrutiny is no longer receiving the expected response back from the public instance of the validator. Workaround: The Validator S.A.C. application is free to use, and installs a version of the w3c validator locally for you. It seems that the app contains a version of the validator that is compatible with Scrutiny. 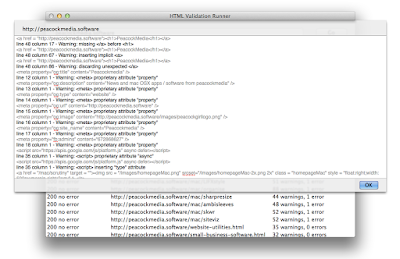 With a little setting up, Scrutiny can use this local instance of the validator and will show results once more. After downloading and running, follow the instructions below 'Advanced Topics' on that page. To switch Scrutiny over to use your local instance of the validator, go to Preferences > Validation and click the text 'http://localhost/w3c-validator' and the address will be pasted into the location box. Wow, it's amazing when stuff like this happens. 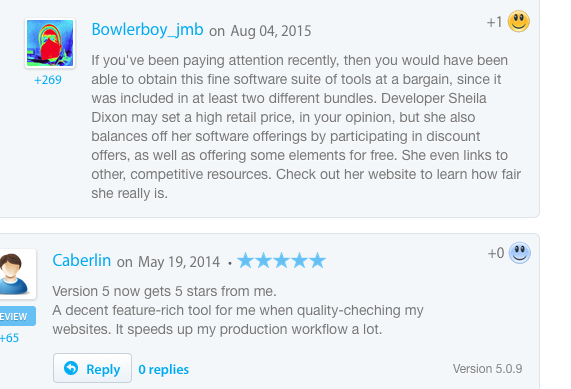 I don't know who bowlerboy is and this certainly wasn't solicited or engineered in any way. 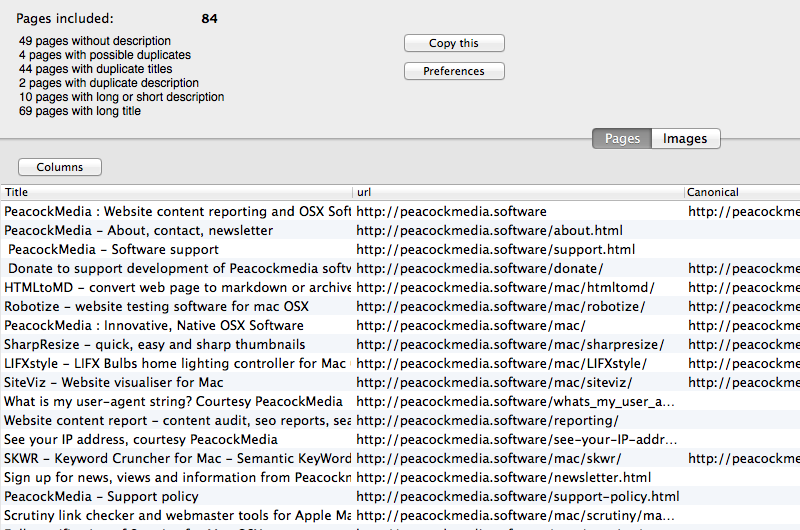 From MacUpdate's Scrutiny page. The problem: Scrutiny fails to retrieve the first page of your website and therefore gets no further. The result looks like this (above). The reason: By default Scrutiny uses its own user-agent string (thus being honest with servers about its identity). This particular website (and the first I've seen for a long time to do this) is refusing to serve the website without the request being made from a recognised browser. With the User agent string changed to that of a recognised browser, this problem may be solved. A milestone! I can't tell you how please I am with our first instructional video. It's a quick tour of Scrutiny for Mac, performing a basic link check, reading the results, discussing a few settings and some troubleshooting. Much of this will be relevant to Integrity and Integrity Plus. ... top marks to tacomusic who has just become the voice of PeacockMedia! 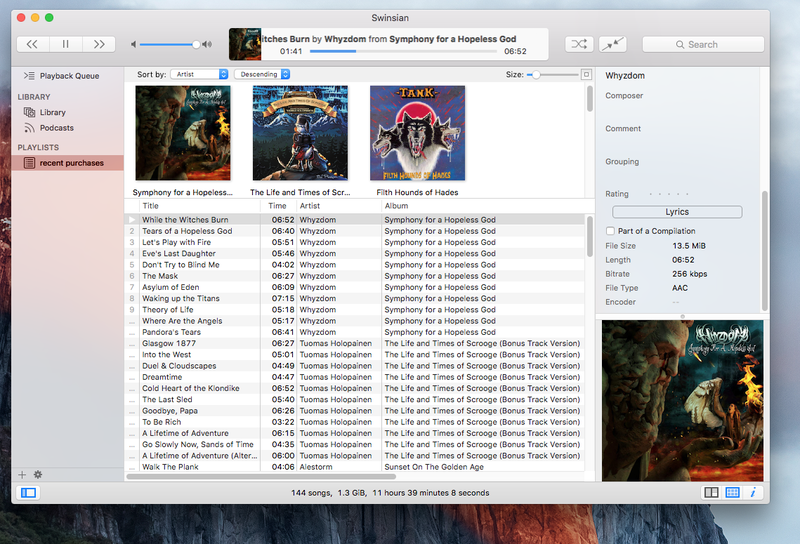 Screensleeves, the album art screensaver for Mac, is currently having trouble displaying the artwork and track details when the new streaming service (Apple Music) is being used. Applescript (the sensible way for applications to talk to each other) is often overlooked - there are ongoing problems with Spotify, although it's been possible to work around most of these. 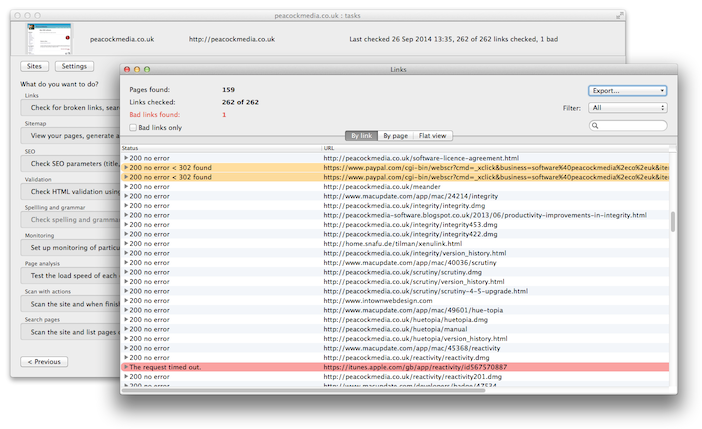 But it's particularly disappointing when Apple themselves neglect their own scripting interface. iTunes' 'current track' seems broken when it comes to the new music service as developers of other apps have reported. I hope that this is 'teething trouble' with the new service and can only suggest installing updates when they're available. A brief message because PeacockMedia's flagship application, Scrutiny, has been included in this bundle at short notice and the clock is already running. 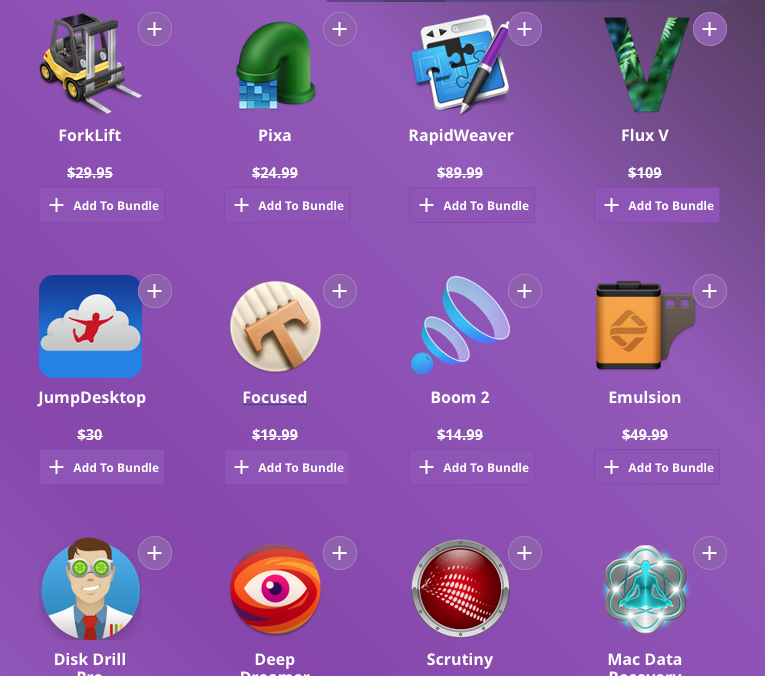 For 14 more days, Scrutiny is one of eight quality Mac apps available at a ridiculous discount in BundleCult's July bundle. I've been developing software such as Integrity and Scrutiny for many years now, supporting and helping users along the way. If you don't want to buy, install, understand and run the software yourself, why not leave it to me? A one-off report will be more cost-effective than owning the software. In fact if you take advantage of one of my Fiverr gigs, *much* more cost-effective. I've recently been helping someone with a few issues experienced when testing a Blogger blog with Integrity. 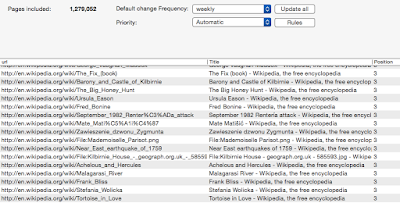 Some of these things are of general interest, some will be useful to anyone else who's link-checking a Blogger site. These tips apply equally to Integrity Plus and Scrutiny. You may have these share links at the bottom of each post. As you'd expect, they redirect to a login page, so no danger of Integrity actually sharing any of your posts. 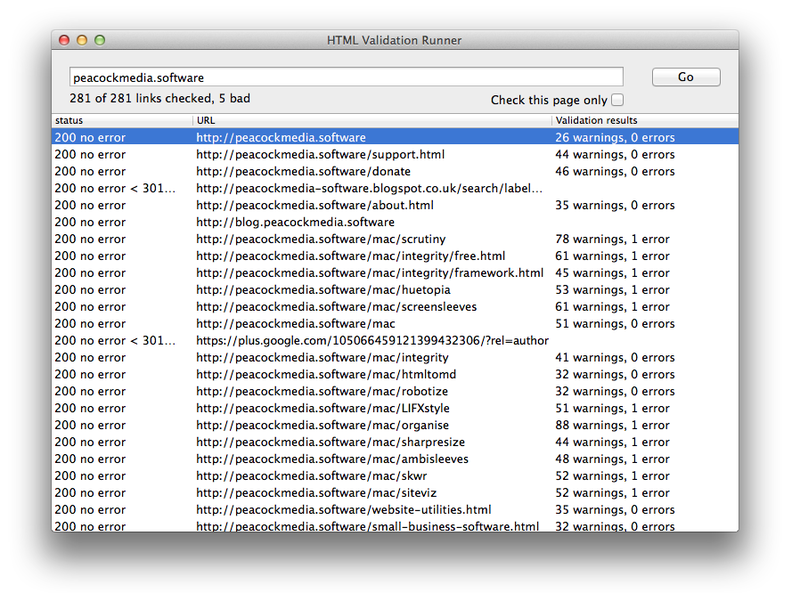 The problem comes when you're testing a larger site with more threads. These links may eventually begin to return an error code. I don't know whether this is because of the heavy bombardment on the share functionality, or whether Blogger is detecting the abnormal use. Either way, you may begin to get lots of red in your results. One solution is to turn down the number of threads to a minimum. This isn't desirable because the crawl will then take hours. A better solution is to ask Integrity not to check those links (it's pretty certain that they'll be ok). 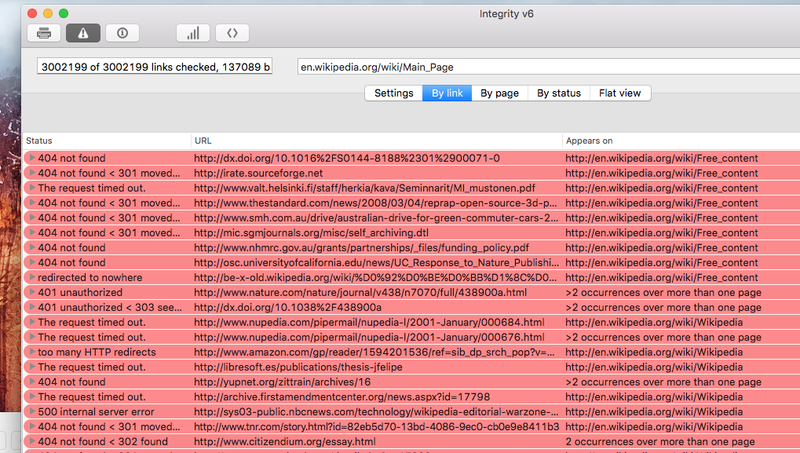 Integrity highlights redirected urls in yellow. Not an error but a 'FYI'. Some webmasters like to find and deal with redirects, but the Blogger server uses redirects extensively and it's just part of the way it works. When testing a Blogger site, you will see a lot of these but it's not usually something you need to worry about. 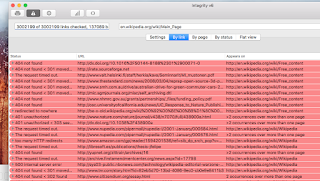 If you like, you can change the colour that Integrity uses to highlight such links - you can change it to white, or better still, transparent. 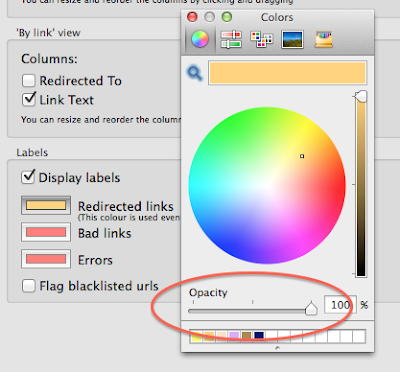 See Preferences > Views and then click the yellow colour-well to see the standard OSX colour picker with an 'opacity' slider. It seems that changing the user-agent string to that of Googlebot stopped these hits from registering. The user-agent string is how any browser or web crawler identifies itself. It's useful for a web server to know who's hitting on it. 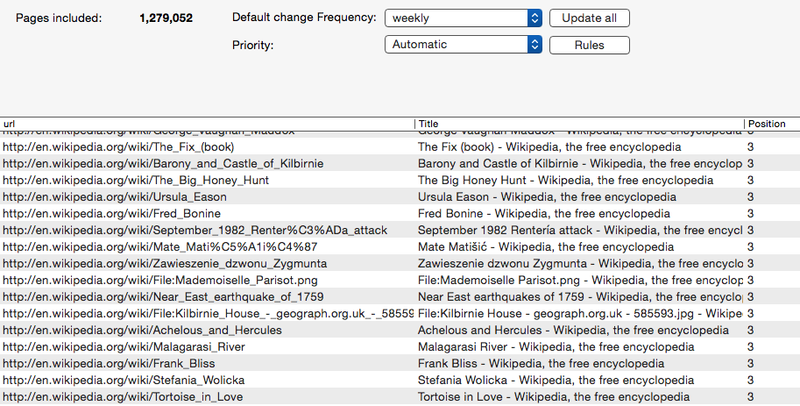 I will be shortly building this Googlebot string into the drop-down picker in Preferences. In the mean time just go to Preferences > Global and paste one of those strings into the 'User-agent string' box. * neither Integrity or Integrity Plus are capable of authenticating themselves, in effect they're viewing websites as an anonymous guest. Scrutiny is capable of authentication, it's a feature that's much in demand (if you want to test a website which requires you to log in before you see the content) but the feature must be used with care - it's not possible to switch it on without seeing warnings and advice. Some people are interested in the redirect code and like to sort those out. Other people just care about the final status of the page after redirection. No problem, choose initial status, final status or the combination which you're used to seeing. The 'bad links only' button will work on this view just the way you're used to. This view can be exported, perhaps you want to expand to show just one particular status, or just 5xx codes for example, before exporting. Finally, one more thing is worth mentioning here as we've touched on redirects. 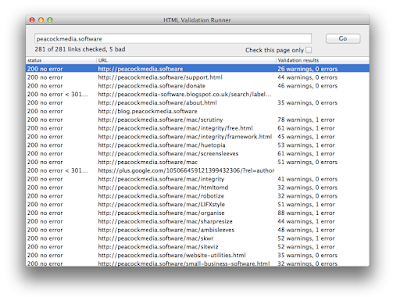 Some people are tasked (or task themselves) with making a list of all redirected urls (3xx). Integrity, Integrity Plus and Scrutiny will achieve the task using the techniques above. But the most effective way to achieve this is to use Scrutiny's filter button for 'redirects'. 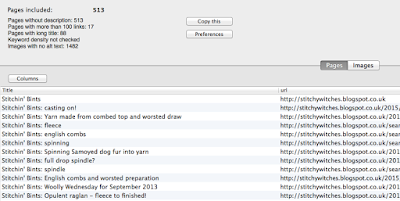 Shown below is the flat view sorted by status but the new 'by status' view will do just as well. 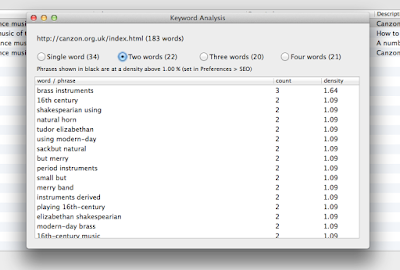 When exported to csv, any filter or search will be respected. The video in the last post isn't terribly clear, so here's a static screenshot of the new 3D theme in SiteViz. I've been working on a tool to display website visualisations from .dot files such as those generated by Integrity+ and Scrutiny. 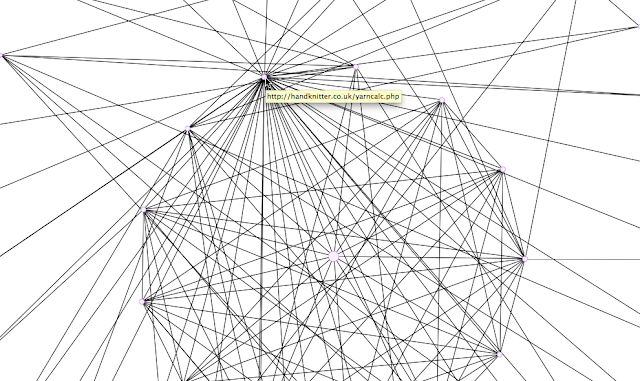 Viewing the website structure in this way can really help to spot problems. For example, while working on the new app I spotted a couple of pages on one of my sites that seemed to have more internal links than others in their level. Turns out those two have out-of-date navigation menus. Look out for SiteViz, work is progressing well. 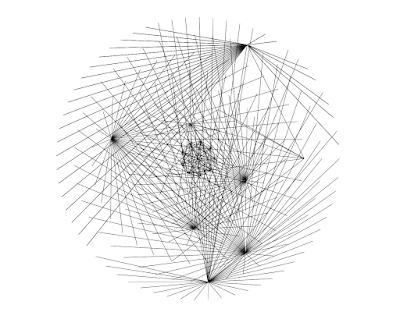 If you have any thoughts about website visualisations (or displaying .dot files generally) then I'd love to hear from you - either in the comments or any other way that suits you. .. aren't getting on. I think it's time for the "we need to talk...." conversation. It just doesn't feel like Apple are the friendly company they were when we met. We've grown apart. I need some space. I'm going to take some time out. To be frank, getting an app available on the MAS is a real ball-ache (and I haven't even got any). Submitting an app takes time. There are so many hoops to jump through and potential problems right there. Once submitted you sit back for maybe a couple of weeks waiting for Apple to get around to inspecting it and you may well get a rejection. Once you've had a few rejections in a row, sometimes your own fault, sometimes not, and then run into a stupid submission problems that you can't get over, it simply becomes not worth the time and effort. 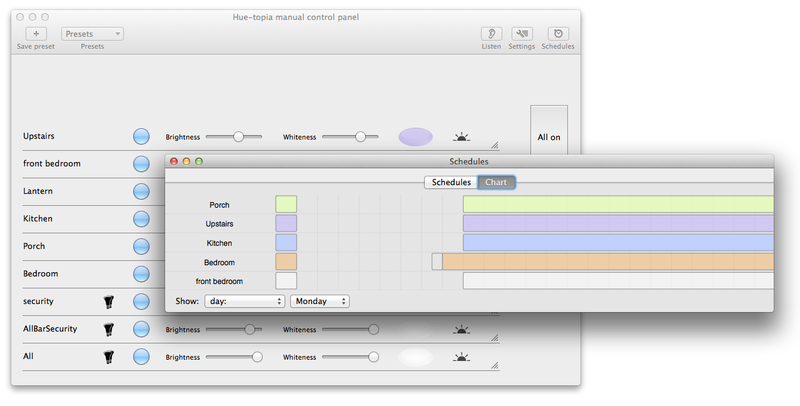 This is what happened with Philips Hue app for OSX Hue-topia. Apologies to those who originally obtained it from the Store, but I've been more than happy to give those people a licence for the web version when they've asked. (That's not to mention sandboxing, a security measure which is compulsory for apps available on the Store. It also makes certain features impossible). If it weren't for the fact that I really want to make an iOS app to support my business software Organise (and have already spent a lot of development time) then I'd happily walk away right now and worry solely about my web sales (thank you Paddle for being easy to use and incredibly supportive). The whole monopoly thing, making the app store the only way to obtain iOS apps was a cold and calculating move. (Oh sure, 'it's all about security'. And you taking 30% of sales.) With each release of OSX I'm half expecting the same thing there. Let me be absolutely clear to my wonderful users, lovely people all. My commitment to my apps is 110%. I will continue to develop and support, the only thing that's in question is my future with the Store. Irreconcilable differences and all that. Flagship application, Scrutiny, suite of webmaster tools, is used by larger organisations and individuals alike. (Read more about Scrutiny here) It seems fair to give the smaller businesses the opportunity to buy at a more affordable price. For two weeks from 8 May, Scrutiny was on offer at 50%. The offer was run by MacUpdate and is now over. Why not download now anyway and take advantage of the free and unrestricted trial? If you're unable to run Scrutiny or don't want to buy, install, understand and run the software, a one-off standard or custom website report will cost less. Recently people have been reporting that the Screensleeves album art screensaver is displaying some information (track name, artist, album) but not all (album art is missing, time elapsed/remaining) when using the Spotify player. Recently there has been a problem where Screensleeves has been unable to detect that Spotify is playing (and displaying the 'Paused' message). If this is your problem then the problem is at Spotify's end and here is the workaround. The newer problem involves Screensleeves recognising that Spotify is playing and some information being displayed, but not the album artwork and certain other information. This latest problem is also at Spotify's end, they are aware and say that they're working on it. Screensleeves is capable of fetching album artwork from the web if none is supplied by the player, though this may or may not be kicking in. I suggest checking Screensleeves' options in System Prefs and making sure that 'If no artwork is available' is set to 'Attempt to find cover image from the web'. Once again, I hope that Spotify will be fixing the problem soon and things will be working as they should once more. Through all of this, other music players have been working fine as far as I'm aware. Luckily, moving domains on the web doesn't involve cardboard boxes and heavy lifting but it can mean things being lost or broken. (Though I've been lucky in being able to use Scrutiny to clean up the links on the new site. 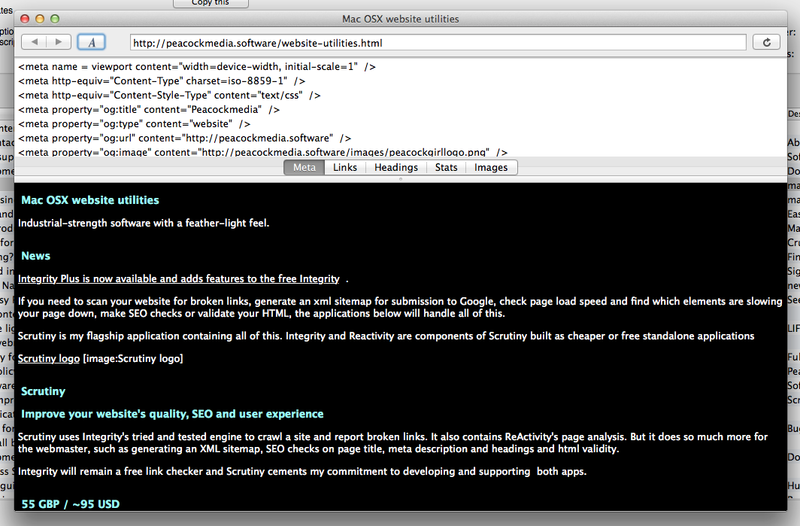 Its new feature - checking the canonical href of each page - is a result of a subsequent need on my part). The website is moving from the co.uk domain (which I've used since about 2000) to a new peacockmedia.software home. This is because Google is treating the .co.uk domain as targeting the UK and there seems to be no way to change that. I'm not sure how I feel about the vast number of new top-level domains. A couple of years ago I failed in a sniping match to secure peacockmedia.com as it became available for registration (and was then offered it for hundreds of pounds, which I wouldn't pay out of principle - there's something really wrong in all of this). I feel that it'll be more difficult for consumers to tell a legitimate website from a fraudulent one from a url. I also rather cynically feel that it's a money-making exercise - businesses (legitimate businesses as well as speculators) will feel obliged to snap up various suffixes. But I'm hoping that the more international new domain will get better recognition by Google in countries other than the UK. Time will tell. Problem: There have been occasions when I've been woken up in the middle of the night by a sound, maybe something innocent, but it hasn't always been. In a half-asleep state I want to be able to reach out and hit a button to switch on all of my lights. I have many connected bulbs, some LIFX, some Hue, so this shouldn't be a big deal. iPhone: This is the most obvious solution, but is actually the most clumsy. There are two apps I have to get into to switch on all of my lights. (Though I could make a single app to do this.) From a locked state that's a lot of pressing and tapping, and doesn't touch-ID always fail to work when you most need it to? It's certainly a long way away from simply reaching out and fumbling for a big 'on' button. A great solution would be to make an app that would respond to the phone being picked up and shaken. 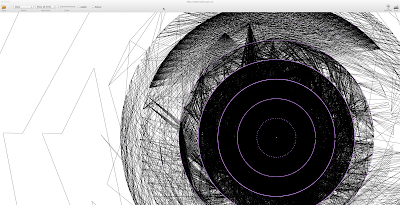 Can an iOS app respond to a shake from a locked state? I don't think so. This solution might work but would probably need the phone to be 'armed' at night by bringing the app in question to the front and turning auto-lock off. Hue Tap: This is exactly the kind of solution I'm looking for, but a/ it would only operate my Hue bulbs and b/ they're fifty quid. Seems a bit much for four programmable buttons purely dedicated to the Hue bulbs. Laptop: I usually have one within reach when I'm asleep. 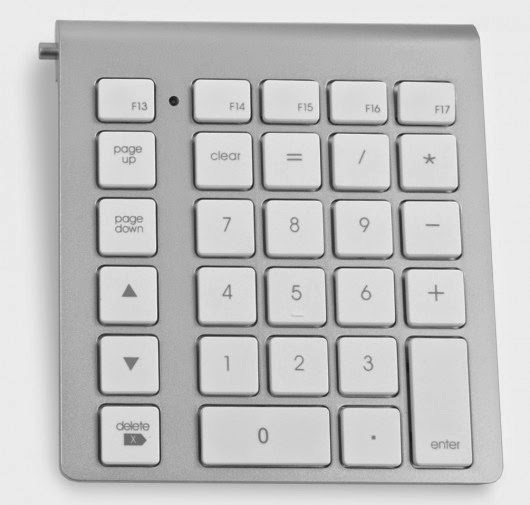 In theory this is pretty slick - reach out for it, lift the lid and hit one of the F keys that I've programmed to mean 'all on'. In practice it takes more seconds than you'd think to fumble for it, lift the lid, wait for it to connect to the wireless network before hitting the key. (When you wake up in the early hours, it's almost painful to squint at a screen.) It would be possible to leave the laptop close to the bed with the lid open and prevented from going to sleep but again this requires some bedtime preparation. It was under my desk covered in dust. 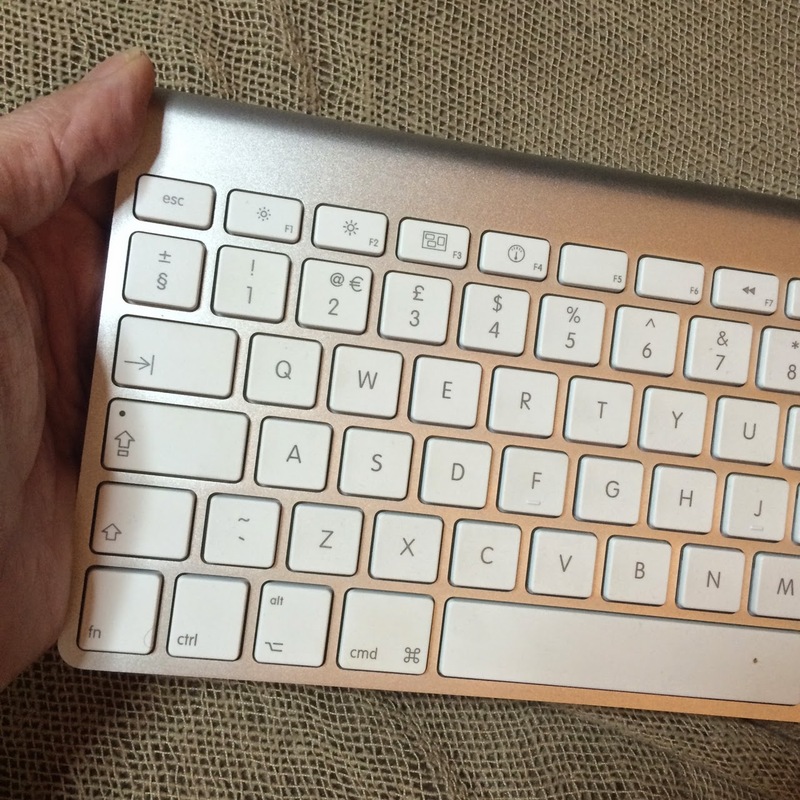 (I love the old white extended keyboards with big clunky keys). It's essentially a bluetooth controller with loads of programmable buttons. Even better is that LIFXstyle and Hue-topia can already respond to F-key presses, with or without a modifier key. 3. in Hue-topia and/or LIFXstyle, go into Preferences>Hotkeys and choose which presets you want to trigger with each F key. That's it - I can reach out and bash one of the first few f-keys. A single keypress triggers a preset in both apps. (I've assigned the first couple of F keys to the same 'all on bright' preset). Other f-keys trigger other presets including 'all off'. It works beautifully, immediately and from anywhere in the house, and even outside. Are there other wireless ways of triggering lights / sending a message to a mac that I've not considered? As always, I'll be grateful for thoughts in the comments.